We have some very exciting news to share: Our next game, Pyre, will launch on PlayStation 4 this summer on July 25, 2017! Our team is hard at work right now putting the finishing touches on it. You can pre-order it right now and get 10% off the $19.99 retail price. Read on to learn more about what we think makes Pyre special. You’ll meet a large cast of different playable characters, such as these fine folk. On top of the single-player campaign, Pyre features a local two-player Versus Mode, which we revealed at the PlayStation Experience last year. Versus Mode lets you play against a friend (or CPU opponent) in one of the game’s fast-paced ritual showdowns. You’ll be able to form your triumvirate from more than 20 unique characters you’ll meet in the campaign, and customize your Rite in a variety of ways — configuring your characters’ abilities, choosing from the variety of stages each with their own distinct effects on gameplay, and more. We think this creates a ton of lasting value for the game and have been having a great time playing it ourselves, trying out every possible character combination we can think of. 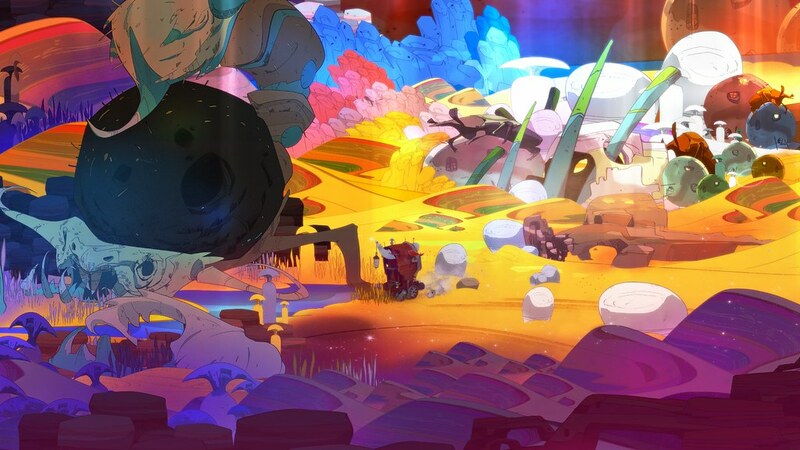 Pyre has been in development for nearly three years. We can now safely say that it’s the biggest game we’ve ever created, offering substantially more ways to play and more characters to meet than either Bastion or Transistor before it. With each new game we’ve made, we’ve endeavored to push ourselves out of our creative comfort zone to make something that felt fresh to us, in the belief that this would translate to a worthwhile experience for our players. We cannot wait for you to try it and hear what you think. I absolutely loved Transistor and Bastion. This game also looks fantastic! I’m really digging the art. I’ll definitely be preordering this! I’d love to see online play at some point as well. Day one. Absolutely adored Transistor. Is there going to be any PS4 Pro support for this title? Thanks. One of my most anticipated games of the year. Bastion got me back into gaming and is one of my favorite games of all time, and I thoroughly enjoyed Transistor. About to order the vinyls for both. Can’t wait to hear this new soundtrack as well as the performance by one of the greatest voice actors in gaming. Let alone the weird and cool world and lore that y’all have created. Thank you for all you do and I can’t wait for July 25! very exciting. I’m a big fan of transistor. All you had to say was Darren Korb. I mean.. that and the fact that you’re Supergiant. Thank you folks for the support! We’re really excited for the launch coming up in just a few weeks. absolutely love your games Greg. 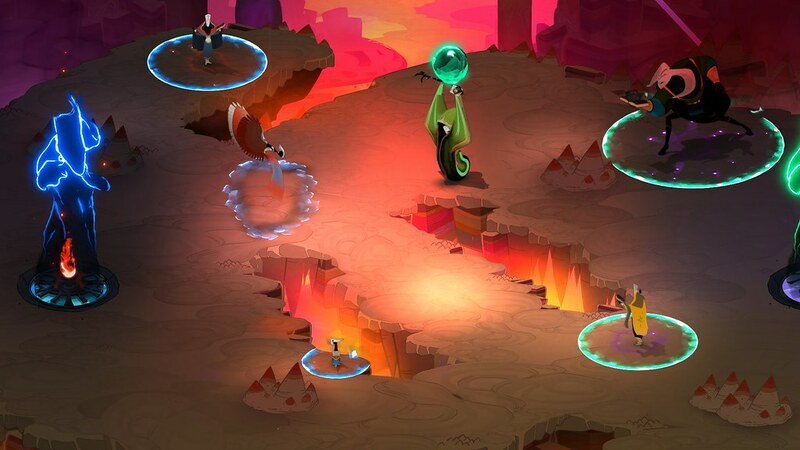 I also loved the dynamic theme SuperGiant had put out with Transistor. are you planning on doing a Pyre theme for PS4? Transistor is my favorite PS4 game, and Supergiant is my favorite development studio. Keep pushing your own creative boundaries and I’ll do my part to support you every step of the way. Can’t wait for Pyre — wishing you all great success with this one! Been waiting for this! Played it at PS experience and loved it. The VS mode is really fun. I can’t wait. Really bummed that the versus mode is only local and not online. I knew this was the case from the last blog post, but I was holding hope for a possible announcement that online multiplayer would be included. I understand the reasons….but from reading about the game and watching vids I just know the versus mode would be a lot of fun. I don’t have a local buddy and playing against the CPU just doesn’t excite me, so will be reluctantly passing. The game does look beautiful however and hope it is a success! My buddies and I had an AMAZING time at PS Experience playing the versus mode! That was our first time playing the game at all but we quickly picked it up and had a blast. I even got to go head-to-head with one of the dev team members and almost won! So Excited to see the final product! Thanks y’all for your work! Big fan of your games. Thank you folks! @anydoubleyou, that’s awesome that you had a chance to try it at PSX, we had a blast there too! There are so many more characters / stages / etc. than that first taste of it, so really excited for you try the full game. The cast of characters in Versus Mode is one of my favorite aspects of the game personally… always wanted to make a game with a big juicy Character Select screen, and we’ve got one here! I love this game in the last PlayStation Experience! I hope The Versus Mode you can play it online, that would be awesome! All my friends live in different cities. Woo hoo! Transistor is one of my top 5 games of all time, and I use the Transistor theme on my PS4. Can’t wait for anything else that you produce. Take all my money, plz! hopefully later on they’ll do a collection like the “journey collection ” that would be awesome.